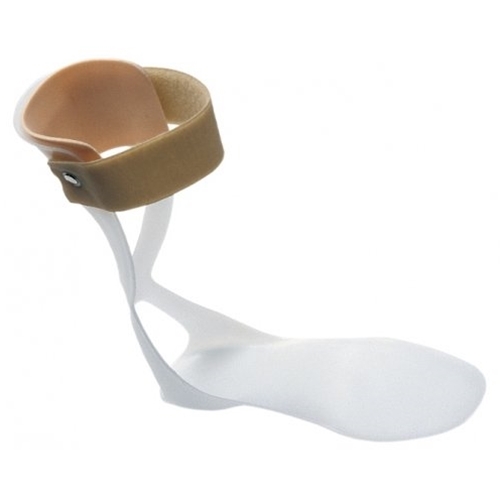 Super Lite Ankle Foot Orthosis (AFO) Drop Foot Brace from HealthyKin.com is fabricated in a predorsiflexed position to provide superior dorsiflexion assist. The anatomical design compensates for atrophy and avoids calcaneus irritation. It is designed to fit into patient's standard shoes. Without a shoe to provide support to hold in place it's unstable. Velcro is good. Needs a strap around ankle to hold in place without a shoe. The Velcro strap was too short, did not fit. Works Great, made to use when you wear a shoe.